Little is more important than your safety. To service your safety concerns, Horizon Glass is proud to be named a preferred installer for School Guard Glass (SGC), a groundbreaking new product, designed to better protect schools, businesses, and public facilities from dangerous intruders. Most recently, we had the opportunity to host our own SGG demonstration and witness the incredible strength of School Guard’s SG4 and SG5 glass. 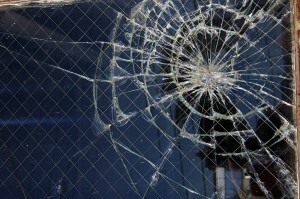 After less than 30 seconds with a baseball bat the demonstrator was able to break and enter through the market’s strongest alternative safety glass. The SGC4, however, outlasted our demonstrator’s, withstanding attack through more than 60 blows. While SGG cracks with impact, it does not shatter or break through the interlayer and holds firm in the frame. Even more amazing, The SGG5glasswas repeatedly shot with bullets, yet it continued to hold strong even under attack from a sledgehammer! View the videos to witness this remarkable glass yourself. Following the tragedy at Sandy Hook Elementary, the innovators of School Guard Glass were motivated to create a new product for schools which could withstand an intruder’s attack and be retrofitted into existing door and window framing systems. This strength and affordability can also be used for government buildings, banks, ATM kiosks, or stores. School Guard Glass products can be made to fit door, window, or storefront frames holding glass from ¼” to 1 ¼”.This revolutionary design allows the same amount of light to pass through the window but does not break or shatter as other blast resistant glass would. School Guard Glass can protect a building for up to 15 minutes, while law enforcement arrives within 4-6 minutes. As a preferred installer, Horizon Glass encourages you to consider how School Guard Glass can protect the important people in your life.